We are thrilled to be a part of the official blog tour for Ben Hatke’s Zita the Spacegirl trilogy – a graphic novel series for young readers about an intrepid, adventurous young heroine named Zita (who has many adventures, as one might imagine, in outer space). In celebration of the publication of the third and final book in the series, The Return of Zita the Spacegirl, we are talking about why we love Zita so much! Savior of planets! Darling and demon of the intergalactic media! Prisoner and prison escape architect! Zita is all of these things. A young, ordinary-seeming girl from the ordinary planet Earth, Zita jumps headlong into adventure when she and her friend Joseph find a mysterious button that falls out of the sky. Joseph is captured by a tentacled, helmeted alien and whisked off to a planet far, far away – leaving Zita (who pushed the button in the first place!) devastated. So what does Zita do? She pushes the button again, and jumps in to find her friend. This, in a nutshell, is why I love Zita the Spacegirl. 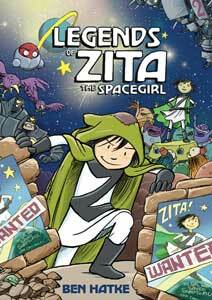 Over the course of these three graphic novels (Zita the Spacegirl, Legends of Zita the Spacegirl and The Return of Zita the Spacegirl), Zita is on a very basic mission: to go home. Of course, along the way, she has plenty of adventures, including but not limited to: an impending asteroid, an impostor Zita robot, some nasty star hearts, and an evil dungeon master. Brave, and a little bit rash (there’s a great moment in The Return of Zita the Spacegirl when she’s being charged for crimes because she didn’t think through some of the consequences), Zita does not shy away from adventure. More importantly, she is incredibly loyal to her friends – from the hapless Joseph, to a mouse who can communicate through written scraps of paper, to an actual pied piper, to robots who possess both too much and too little self-confidence. This theme of friendship and loyalty – not just from Zita towards her friends, but from her friends towards Zita – is at the core of these graphic stories and what I admire so much about these books. Of course, there’s plenty of other things to love, too – these are gorgeously drawn stories, with crafty villains and impossible predicaments. There are moments of hilarity and plenty of awesome tongue-in-cheek puns – my two favorites: a Heart Attack, and two prisoners who are together Rag and Bones – plus truly inventive and brilliant solutions to the aforementioned impossible predicaments, that unfold both in Ben Hatke’s zippy script and boldly colored artwork. Another thing I appreciate about this series very much is that there is a forward sense of momentum and growth. While these three graphic novels are a collection of Zita’s adventures, they are all working towards a single overarching goal of getting Zita home safely – and every encounter of Zita’s is cumulative (they don’t simply happen as one-off episodes and are forgotten). There are darker themes, too, as Zita struggles with fame, public perception, and the all-important Consequences of her daring escapades. By the time we reach The Return of Zita the Spacegirl, her actions actually might mean the destruction of Earth itself at the hands of an evil alien overlord! Never fear, though – with the help of her friends, Zita is able to stop said overlord and find her way back home. 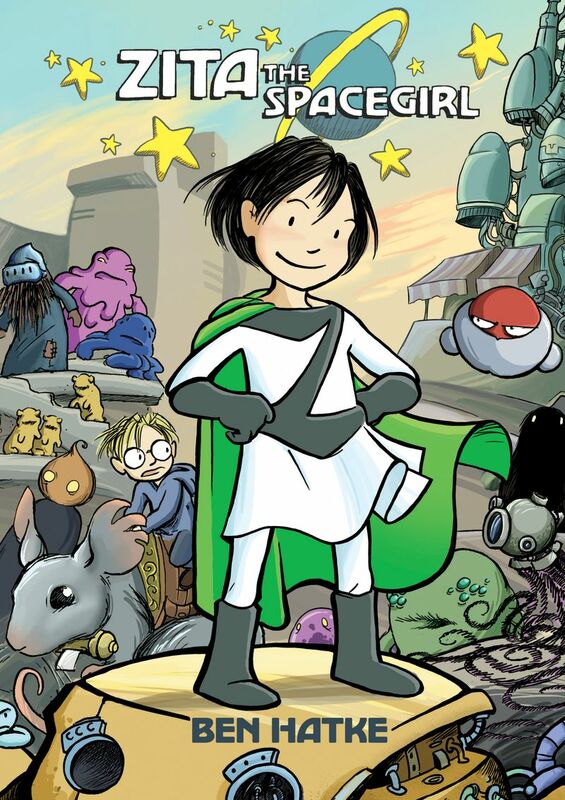 Suffice it to say, I love Zita the Spacegirl very much and wholeheartedly recommend the series to readers and adventurers of all ages. Want more Zita? Check out the stops on the “My Favorite Thing About Zita the Spacegirl” Blog Tour! Because we love this series so much, we’re giving away a copy of any one of the Zita the Spacegirl graphic novels (winner’s choice). This is open to ALL and will run until Sunday, May 18 at 12:01am EST. For a chance to win, use the form below. GOOD LUCK! And happy space travels. Why I want to read it? Well- first: a warm recommendation from the Book Smugglers 🙂 Second- I have a 6yo at home. She might be too young for it right now but I figure it is never too soon to start preparing… And last- because it just sounds like a fun read for me! I haven’t read Zita yet, but I can’t wait to! I adore sci-fi, and to have it in a graphic novel AND a series AND feature consequences and loyalty? So much wonderful! There’s always more room on my bookshelves for such beauties! The illustration first really caught my eye and then I really liked the ideas behind the series. I will have too look into them. I was thinking about reading them, but hadn’t gotten around to it yet. And then you showed a picture of an enormous cat with trippy eyes and a fabulous name. So you’ve convinced me to start them now. This is my first introduction to Zita the Spacegirl. The stories sound delightful, and I like the bold, bright illustrations too. Thanks for the chance to win one. The books look great – I know they’d get a lot of attention in our K-5 library. Thanks! Hey! 🙂 I’ve just stumbled across your little corner of the web and I love it! This sounds like so much fun. Something to look forward to. My daughter and I just discovered Zita last month. I read the first book to her something like a half dozen times. We have not read the second book again – cliffhanger! My daughter keeps asking when the next one is coming out. These are so much fun but have unexpected depth and allowed my daughter and I to have a conversation about being a hero means. Wow! Can’t wait for the next one – counting the days. 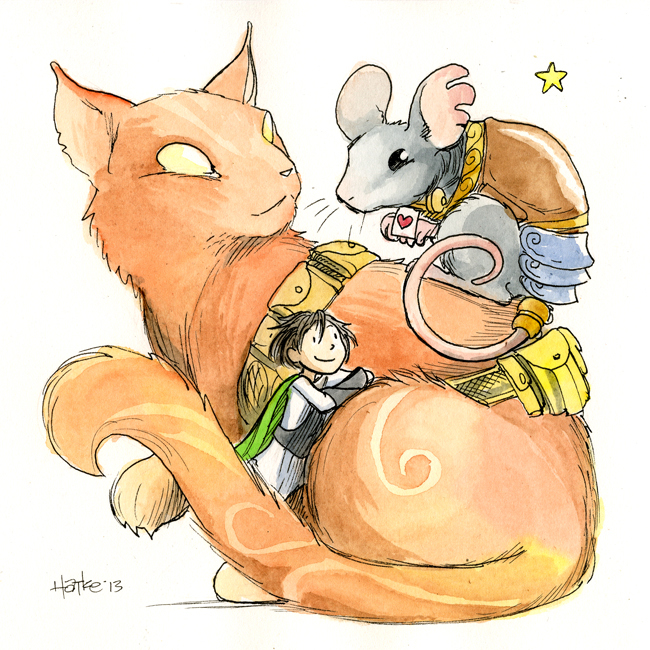 The artwork of any graphic novel is *very* important to me, and I’ve loved Ben Hatke’s style since before I read Zita. And of course, Zita herself is a feisty girl superhero, and a great hero for girls to look up to. I teach 3-5th graders and I can think of one student in particular who would love these books. Off to the library I go.